It’s festival season, and with our fair share of sustainable clients from Eco-Age and Invicta Plastics to Wrag Wrap, we had an idea. 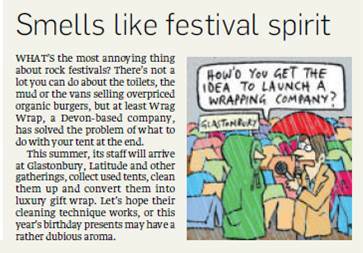 Why not send the Wrag Wrap team to Glastonbury to collect discarded tents, and create luxury recycled gift wrap – the way that Wrag Wrap does best! This is exactly what Nicky and Lou will be doing after the festivities this weekend. With 3,000 tents being dumped at festivals across the UK this year, that’s a lot of gift wrap!